When will your child need to wear their glasses? A child who must wear glasses full time may need more than one pair. Think about how they will cope if their glasses are broken or lost. 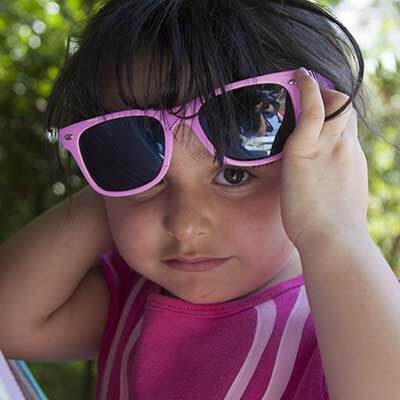 In the summer months it may be necessary to have a pair of prescription sunglasses to protect the eyes from the harmful effects of ultra violet radiation. 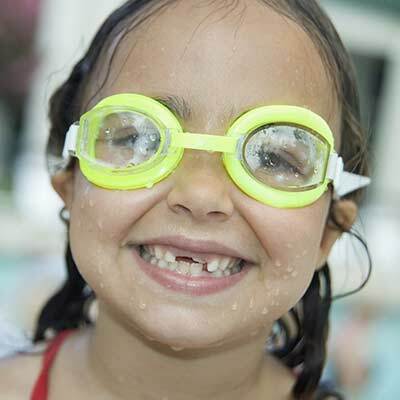 Your child may find sports and swimming more enjoyable if he can see properly. Prescription swimming goggles and safety glasses for sports from cycling to squash and skiing are available. Please ask. All children’s glasses are fitted with plastic lenses for safety reasons but a very boisterous child may still be at risk from eye injury through breakage during play. Under these circumstances, or if your child plays a lot of sport such as squash and tennis, cycles or skate boards, it might be worth considering a more substantial material such as polycarbonate – Or even purpose designed sports frames. A very active child may benefit from a sports band to hold his frame more securely and a forgetful child might find a spec chain or cord useful. Colourful spec cases help to protect frames and make them easier to find when misplaced. Sticky fingers make dirty lenses and lens cleaning solutions will encourage him to clean his lenses anywhere. The primary purpose of the frame is to carry a pair of lenses in the correct position in front of your child’s eyes. So the first consideration has to be the fit of the frame. There must be sufficient head width, side length and bridge width to ensure a comfortable fit with some growing room. The style must be suited to the power of lens so that the frame is well balanced in terms of lens weight to frame strength. Consideration must also be given to the frame design which must be compatible with your child’s facial characteristics. The lenses must sit so that their optical centres are in the optimum position in front of the eyes. Generally this means that your child’s eyes should look approximately through the centre of the lens vertically, and slightly nasal of the centre horizontally. In order to achieve this, the positions of the eyes, ears and nose must correspond with the bridge design and side height and angle of the frame. The next consideration is personal taste. Obviously if your child likes his glasses he will be happier to wear them so it is important that he has some say in the final choice. Fortunately, there are beautiful frames around today to fit all budgets and hopefully there will be a pair to suit everyone. Take your time choosing and involve the whole family if you can. Sibling approval can be as powerful as peer pressure. Choose when your child is in a good mood. If he is tired after his eye examination call in on a different day. If he is distressed at the thought of having glasses take him home and talk it through. Most children come round to the idea and many are surprised to find that their friends are actually jealous. Glasses are very ‘in’ at the moment. Many celebrities make a fashion statement with them. People own more than one pair now so that they can change their glasses to suit the occasion or their mood. Sports manufacturers are joining the increasing number of designer names that manufacture their own range of prescription and sunglasses. Eye protection for leisure activities such as cycling and racket sports is becoming a familiar sight. Glasses are creeping onto the catwalk and into the fashion magazines. A significant number of people even buy empty frames to enhance their image. Be careful not to let any prejudice that you may have against glasses influence your child’s attitude to wearing them. He must feel secure and at ease with the idea that glasses are a tool to promote healthy efficient eyes. A quality frame does not necessarily mean an expensive frame with a designer label, and a designer label does not guarantee that a frame is of adequate quality. When choosing frames for children resistance to impact is all important. It is advisable to consider spring loaded joints if your child is boisterous or likely to mistreat his glasses. These joints flex and ‘give’ if there is impact to the side of the frame or if a child has a tendency to remove the glasses using one hand only, and then spring back to their original position. On less substantial frames the side joint will readily splay, compromising comfort and stability of the frame. The frame will then require repeated adjustments and over time the metal will fatigue and distort with the slightest pressure. Some good quality frames do not have sprung joints but are constructed using more robust metals that have greater resistance to impact and wear. A good quality frame is well balanced with good bridge support on the nose so that the weight of the lenses does not pull the frame forward. A lot of children’s frames come in a number of bridge and eye sizes ensuring optimum fit. Some have, and most can be fitted with, silicone pads which, although less robust, are made from a ‘tacky’ material that grips the nose more securely than hard pads. These are very useful if your child has a small bridge to his nose or heavy lenses. Some baby frames have built up bridges to compensate for immature nose development and curl sides that can help to grip the ears more securely. Budget frames are just that. The quality is not marvellous and they are designed to fit the ‘average’ face. This usually means that they are made in a limited number of sizes and are basic in style. For this reason they can be mass produced at cheaper prices. They will not generally fit unusual facial characteristics such as asymmetric faces or immature noses on older children and, unless very carefully looked after, are not suitable for high or asymmetric prescriptions where good fit and a well balanced frame are crucial. Their one advantage is that they cost little or nothing and can be repaired and replaced at little or no cost. But be prepared for extra visits to have them realigned and possibly repaired at regular intervals. When lenses are prescribed for your child their power is determined on the understanding that they will be sitting at a specified distance from your child’s eyes. If this distance is altered the effective power of the lens is altered. This change is relatively small for low powered lenses, but becomes more significant as lens power increases. If the frame is distorted so that the two lenses sit at different distances from the eyes then the balance between the lenses will alter so that two lenses that were the same will now have different effective powers at your child’s eyes. If your child has astigmatism it may have been described to you as a rugby ball shape on the refractive surface of the eye, so that there are two different shapes curves, at ninety degrees to each other and orientated at a particular angle. The corrective lens is of equal and opposite shape, and also at a particular orientation. If the frame is misaligned or a nose pad is missing so that the front is tilted then the orientation of the lenses will change and they will no longer correct the astigmatism. If your child wears bifocals a tilted front means that one eye will look through the reading segment when the other is not, putting the eyes out of balance. Your child may have to adopt compensatory postures to cope. A frame that is too far from the eyes will reduce your child’s field of view through the lenses and maximum field of view is essential to good eye movements. A distorted frame is an uncomfortable frame and the discomfort will distract your child’s attention from his work and to his glasses. As soon as you notice that your child’s glasses are out of alignment then pop in for an adjustment. If you do not feel confident in your ability to judge this then pop in regularly and have them checked. How often will depend on your child. For some weekly, or even daily, is necessary.